Ararat’s iconic Town Hall is closing its doors ahead of an historic $6.235 million redevelopment. 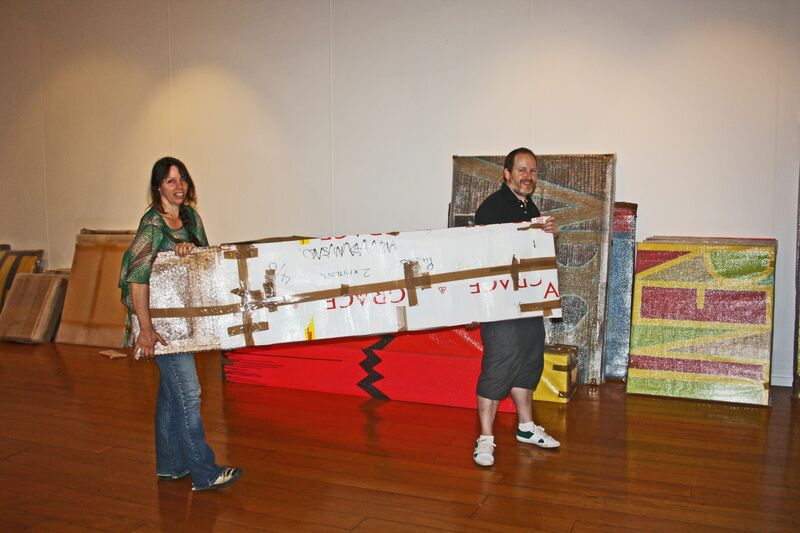 Ararat Regional Art Gallery Director, Anthony Camm and Gallery Program Support Officer, Wendy Stevens moving part of the collection into storage to make way for construction. Ararat Regional Art Gallery and Ararat Performing Arts Centre staff have started moving out of the area and into temporary accommodation to make way for construction to begin in April. The Gallery temporarily closed its doors to the public last week and Ararat Regional Art Gallery Director, Anthony Camm said the process would be carefully orchestrated over the coming weeks. “Everything will be catalogued and spaces are now being prepared to safely store our valuable collection at temporary accommodation in the old Ararat Advertiser building in Ligar Street," he said. Mr Camm said a great deal of planning had gone into ensuring Ararat was not a 'cultural void' during the year-long arts precinct redevelopment. “We expect construction to be complete early in 2018 and during all of that time we will deliver a rich program of events and activities,” he said. Ararat Regional Art Gallery will present a regular exhibition program from the Ararat Library, but also has prominent events planned in unexpected locations in the region. Meanwhile, the Performing Arts Centre also has a busy calendar of events lined up for the year, with the first few performances taking place at the Ararat Town Hall. Events will include the regular Morning Melodies series, which will be presented at the Alexandra Oval Community Centre, tribute show ‘Cash, Monroe & Presley’ and the Melbourne International Comedy Festival Roadshow on the May 27 at the Stawell Entertainment Centre. PAC Venue and Program Coordinator Dianne Toulson said a full program of performances would be presented later in the year across the municipality, including Willaura, Pomonal, Moyston and Lake Bolac. “We are excited to deliver cultural experiences directly to our smaller communities. It’s a great chance to build a community of performance art lovers who can then enjoy our beautifully refurbished theatre in 2018,” Ms Touslon said. A full program of events for ARAG and the PAC will be made available at www.ararat.vic.gov.au and updates will also be provided on social media. “We understand there might be some inconvenience during the construction and redevelopment of the arts precinct, especially for the many community users of the Town Hall, but this is a once-in-a-lifetime opportunity to significantly upgrade and future-proof one of our most important community facilities," Mr Camm said. The project has been funded through a partnership between the Victorian Government ($3.7 million), the Federal Government ($945,000) and Ararat Rural City Council. Construction is due to begin in April this year.